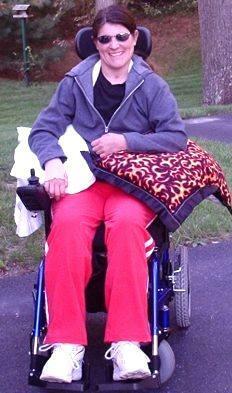 Amber Golaboski is raising money to pay for uninsured medical expenses associated with her spinal cord injury. Amber lives in Gambrills, MD. Amber was involved in a near fatal motorcycle accident on Nov 5, 2005. A driver who was impaired on drugs crossed the center line and collided head-on with the motorcycle on which she was a passenger. In addition to multiple fractures, the accident caused a devastating spinal cord injury. Since that time, Amber has been pursuing a rigorous course of therapies aimed at recovery. Her progress has been slow, but notable. Amber’s spirit and determination remain intact, but the cost of uninsured caregivers and recovery-based therapies is staggering. To help with some of these uninsured injury-related expenses, Amber has chosen to fundraise with HelpHOPELive Catastrophic Injury Fund in part because HelpHOPELive provides both tax-deductibility and fiscal accountability to her contributors. Contributors can be sure that funds contributed will be used only to pay or reimburse medically-related expenses. To make a contribution to Amber’s fundraising campaign, click the “Contribute Now” button. To email this page directly to others in your community who might wish to learn about Amber’s campaign, click the email button and type in as many email addresses as you wish.